Flight delayed by 3 or more hours? Flight cancelled due to airline issues? Did you miss your connecting flight? Were you denied boarding your flight? "Making a claim is quick and easy, and our expert solicitors provide you with an instant decision." Any delay to your flight plans can be hugely inconvenient and also costly. Whether your intended flight is for business or personal reasons if your chosen airline disrupts your plans you could well be eligible to claim flight compensation. Thankfully making a no-obligation claim enquiry is as simple as providing us with a few details about your flight then leaving us to handle everything else on a no-win no-fee basis. To get an instant claim decision, complete the form above now! Delayed flights: If a flight you were trying to make was delayed by the airline for more than 3 hours then it is your right to receive compensation direct from the airline. This applies to any flights of yours that were delayed over the last 6 years. Cancelled flights: If you booked a flight only to find out it had been cancelled due to an issue with the airline then you should be compensated. In fact the compensation payout can be more than £500 per passenger to make up for the hassle caused by cancellation. 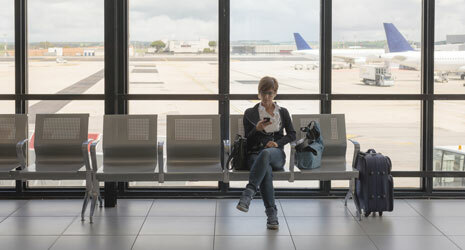 Missed connection: If you missed your connecting flight as a direct result of an airline issue then your compensation claim should be successful. All connections missed in the last 6 years should qualify for compensation, and the payout could be more than £500. Denied boarding: If you have been denied boarding your flight against your will due to an airline issue such as overbooking then you should make a compensation enquiry. We can find out if you have a valid compensation claim for your boarding denial. If you have experienced any disruption to your travel plans due to the reasons above you could well be eligible to receive compensation. Let us give you an instant decision on how much you are entitled to by completing our online form. Your intended flight must have been set to arrive or depart from an airport in the EU using an EU airline. Only issues with the airline are considered for compensation. External influences are not. THe amount compensated is directly affected by the distance of the scheduled flight. Let us make an instant no-obligation decision about your flight compensation claim by completing the short form above. In order to claim any flight compensation you may be entitled to yourself, you will have to get in touch with your chosen airline and go through the claims procedure. This can be lengthy, time-consuming and very complicated especially if you are not alone in your claim. The preferred method by many looking to claim is to use our free service which puts a flight compensation solicitor on to your case on a no-win no-fee basis. We then deal with the airline direct and argue your case professionally and efficiently. All you have to do is collect your compensation at the end! We do this for 1000s of UK customers, and any fees are deducted from your compensation, leaving you with the rest!